Synopsis: When burglars are caught breaking into the Democratic National Committee's offices at the Watergate Building, Washington Post reporters Bob Woodward and Carl Bernstein investigate a possible cover-up perpetrated by the Nixon administration. Andrew: Hello readers! Yesterday Sarah and I were trying to find a way to beat the heat and get out of the apartment, so we hit up the mall and our nearest Best Buy. While at Best Buy we stumbled across All The President’s Men on DVD for only $4.99. We couldn’t pass on adding this classic film to our collection, now could we? Sarah: When we got home we popped it into our laptop and sat in front of the air conditioner. It was during this viewing that we decided we wanted to review it and make it the first edition of a new feature we’re going to do called Retro Reviews! A: We know it’s not an unheard of idea, to review older movies, but we kind of figure that if we’re going to review films that have been around for a while – and especially a classic film such as All The President’s Men – then we wanted to differentiate them from our new film reviews. S: All of that said, we also want to make a cutoff point for any films we deem “retro.” This self-imposed cutoff point is going to be the year 2000. Any film we review that was released prior to 2000 will be a Retro Review. Anything made in the 21st century really isn’t retro, now is it? A: That’s our thinking anyways! 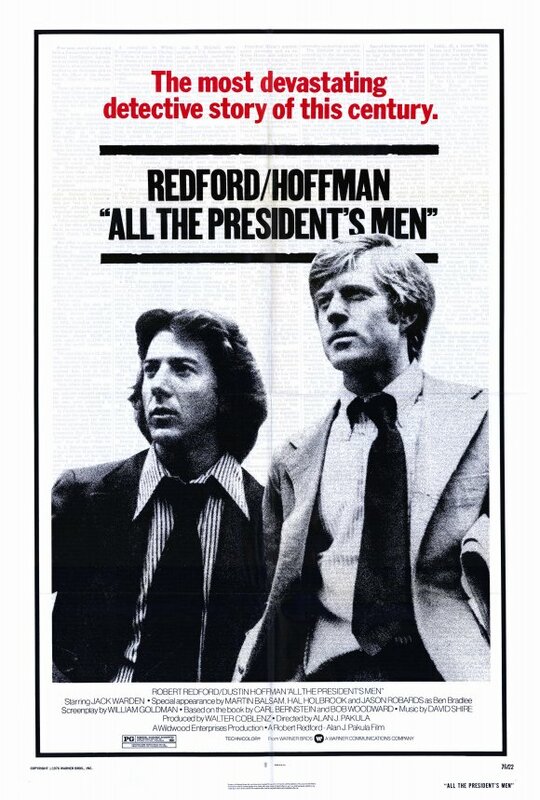 Ok then, Sarah, I’d like to kick off our review of All The President’s Men by pointing out just how DIFFERENT the style of film-making was for this movie than any movies we have nowadays. There are so many long, drawn-out shots of Robert Redford’s Bob Woodward and Dustin Hoffman’s Carl Bernstein sitting in their newsroom talking about their story. And not only are they long takes, but the composition of the shots themselves are noticeably different, too, in that they’re incredibly wide. S: Yes, which I really liked! In today’s Hollywood, directors like to keep tight shots on their actors, forcing the audience to focus on one character at a time. Our main characters in this movie are a team. And not only that but they are a historical team. We as the audience needed both reactions. The long drawn-out shots give the audience the whole story; it makes the small details come to light in such a big way. A: And I felt like the wide shots of the newsroom, with the bright fluorescent lights, white walls and desks that alternated between being empty or busy depending on the time of day they were working gave us a great feel for the environment they had to work in. And I hate to sound like I’m gushing, but one of my absolute favorite shots and scenes is when Woodward is first starting to write his story, he gives it to the copy desk, and Bernstein saunters over and takes it to his desk to “polish it.” The angles of the set, the camera, and Redford and Hoffman’s performances are top-notch. S: That is a great shot. Let’s be honest this movie is a classic for many reasons that we could gush about, but we should keep it pretty tight. While it is still a movie, the story that “Woodstein” broke to the country is one that will stay in our history for the rest of time. The way that they brought it to the screen was one of brilliance. Pakula made scenes feel intense and sometimes a little scary as well as bringing humor through the eccentricities of the journalists. A: Good points. While I do feel like there are times the film seems to drag along, I do like how as Wooward and Bernstein’s investigation gets further along the more the tension and paranoia rises. I think that goes back to how the filmmakers do a good job showing us what the journalists were really going through at the time. Before I forget this point, did you notice how there is almost NO music or score used? Plenty of scenes in the newsroom, or scenes where they make breakthroughs while working in their apartments, etc. had no music behind it. I really liked that. Now while this movie is usually shown in High School English classes or Intro to Journalism college courses and can seem a little dull at times, it highlights one of the biggest cover-ups by the government, one of the most important investigations in history and is portrayed beautifully in this film. 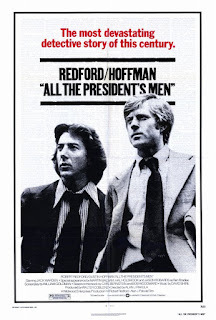 A: All The President’s Men is the kind of film where even if you’re not in school anymore, if you’re a fan of filmmaking and especially if you went to school for journalism, you should watch at least once a year. And I think that’s exactly what we’re going to do. It’s not a perfect movie, but it’s darn close. Jen! You gotta get on that! When you see it, you'll have to let us know what you think about it!